Although the phrase “Laughter is the best medicine” has been around for a while, new research is showing it may be true. A good chortle or guffaw can reduce stress and pain, among other health benefits. You can sign up for laughter therapy and be part of a new movement to formally introduce laughter into people’s lives. Laughter has really changed my life. I feel happier and more focused about things that make me happy. It has changed me from being a serious person to a much lighter person. I also use laughter as my personal stress management therapy to keep my stress levels low, as I have a very stressful job. —Brigette, Denmark, Laughter Yoga website. Laughter classes and workshops might appear ridiculous. After all, we all know how to laugh, right? Yet, in a high-stress and fast-paced world, many people don’t seem to have the time or focus to let loose a giggle. Recent research has found that the effects of a good chortle can reduce stress and pain, boost the immune system, provide social connections and make people happier. It’s part of a new movement to formally introduce laughter into people’s lives, including at senior living facilities. It started with Laughter Yoga and its clubs, and now there’s even a Laughter Wellness Institute and Laughter Online University to help tickle your funny bone. While it may be hard to imagine that a good laugh can have health benefits, a good guffaw changes us physiologically. We stretch muscles throughout our body, our pulse and blood pressure go up and we breathe faster, sending more oxygen to our tissues. 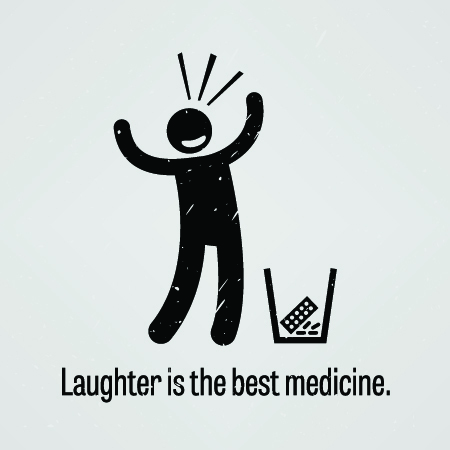 A good laugh shouldn’t leave you in stitches but instead help you feel relaxed through your whole body. • Improve your immune system. Laughter can turn negative thoughts, which cause stress, into positive ones, thereby decreasing stress hormones. Because increased stress is associated with decreased immune system reaction, some studies have shown that the ability to use humor may raise the level of infection-fighting antibodies in the body and boost the levels of immune cells. • Stimulate organs. Laughter increases your oxygen intake; stimulates your heart, lungs and muscles; and triggers the release of endorphins, the body’s natural feel-good chemicals. It improves the function of blood vessels and increases blood flow in the heart, which can help protect against a heart attack and other cardiovascular problems. • Relax the whole body. A good, hearty laugh relieves physical tension and stress, leaving your muscles relaxed for up to 45 minutes afterwards. It can also improve sleep. • Relieve pain. Laughter may ease pain by causing the body to produce its own natural painkillers. It may also break the pain-spasm cycle common to some muscle disorders. • Improve your mood. Laughter can help lessen depression and anxiety and make you feel happier, if only temporarily. A happier state of mind makes it easier to cope with difficult situations and helps you connect with other people. One of the main forms of laughter therapy is laughter yoga. Started in 1995 by an Indian physician, Madan Kataria, who wrote a book, Laugh For No Reason, the program has grown to thousands of Laughter Clubs in more than 72 countries and is practiced in companies, senior living facilities, schools, colleges, fitness centers, community centers, prisons, hospitals, homes for the physically and mentally challenged and cancer self-help groups, according to the Laughter Yoga website. Laughter yoga is different than “spontaneous” giggling that comes from watching a funny movie, hearing a good joke or seeing your cat accidentally roll off the table. Instead, it relies on a set of exercises that stimulate laughing and use yoga breathing (deep and from the diaphragm). This “voluntary” chuckling has the same benefits as true laughing, especially since fake snickering often turns into the real stuff. You do laughter yoga in groups, with lots of eye contact and playfulness, and this form of yoga can even provide benefits for the humor handicapped —introverts and those who have no sense of humor. Laughter yoga’s exercises involve movement, such as arm waving, which adheres to the yoga philosophy of a strong connection between body and mind. “If one changes the quality of thoughts, one can feel a change in body behavior. Conversely, if one can bring a change in body behavior, one can experience the change in mental state” (from the Laughter Yoga website). One exercise is Lion Laughter, derived from a yoga posture. You stick out your tongue while keeping your mouth open. With eyes wide, you stretch your hands like the paws of a lion and roar, followed by laughing from the belly. Another exercise is Cell Phone Laughter, in which participants hold imaginary mobile phones and try to laugh, while making different gestures and moving around in the group to meet different people and laugh. To find a laughter yoga group near you, visit the website. A similar concept, Laughter Wellness is a health program that uses therapeutic laughter and associated techniques to enhance health and well-being. To achieve benefits and a few giggles, the program uses three primary tools: low-impact aerobic exercise that works the mind and emotions, neuroplasticity that restructures brain neurons to be more positive and creative and a safe space for people to connect. Laughter therapy is well-suited for older adults. Laughter exercises are low-impact, requiring you to simply open your mouth, move your arms and possibly move your legs. For patients with Alzheimer's or dementia, who no longer comprehend humor or have become nonverbal, laughter yoga can relieve stress and provide emotional benefits from interacting with others. In terms of psychological benefits, a 2011 study of laughter yoga, published in the International Journal of Geriatric Psychology, found that laughter yoga classes were at least as effective as exercise classes in relieving depression among elderly women. And laughter yoga significantly decreased depression compared to a control group that didn't exercise or participate in laughter yoga. Laugh Your Stress and Pain Away was featured in the July 2015 edition of Senior Spirit.